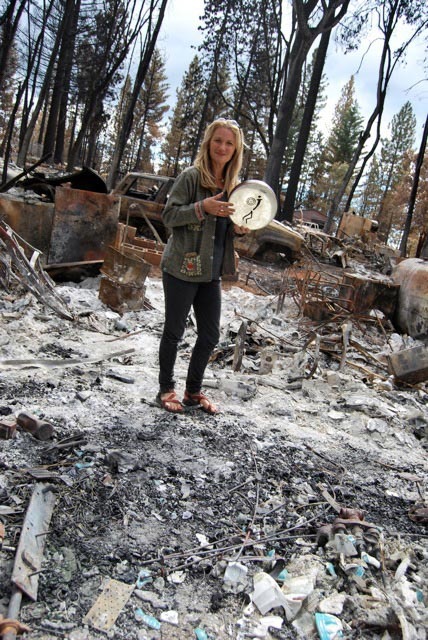 After three days of offering music therapy and drumming to the community devastated by the Valley Fire, I remain convinced that music is a first response to disasters, not as entertainment or distraction, but as a way into the forest of inner emotions and a natural tool to uplift the spirit and build relationships. Into this house we're born, into this world we're thrown"
As the tall thin man walked towards us on his way to the FEMA tent, I held out my hand and introduced myself. Holding my three-string strumstick guitar, I asked if there was a song I could play for him. Riders on the Storm, he requested…. a fitting song given the intensity of long evacuation periods and numerous homes burned by the Valley Fire. 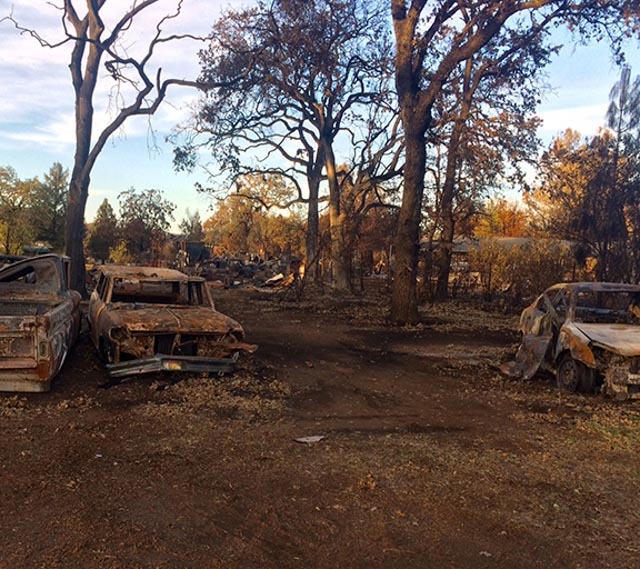 At last count, the fire had destroyed 1900 structures, 74,000 acres, caused 3 deaths, and left thousands of people displaced in Lake, Napa and Sonoma counties. What is the medicine of music that provides comfort, healing, and expression to victims of disasters? How can music be more than entertainment, and used as healing. We offered music to the community for three straight days. 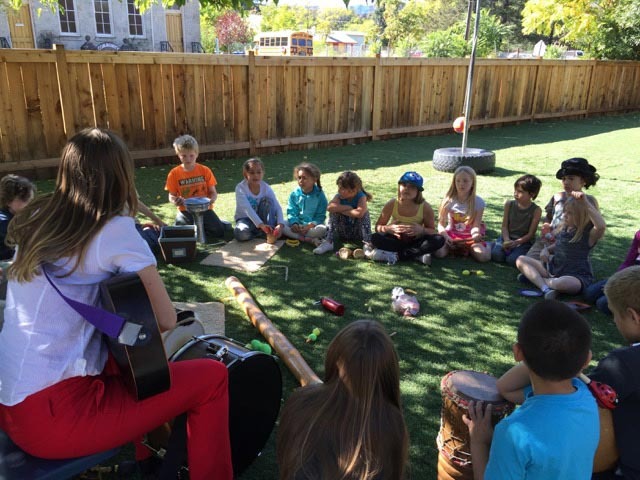 In our first responder emergency kit, we brought uplifting drums, clearing rattles, soothing flutes, calming kalimba, metaphorical rainstick, eye-catching strumstick guitar, and our soulful harmonizing voices. On the final evening, three musicians and music therapists from Petaluma drove a few hours to join us. 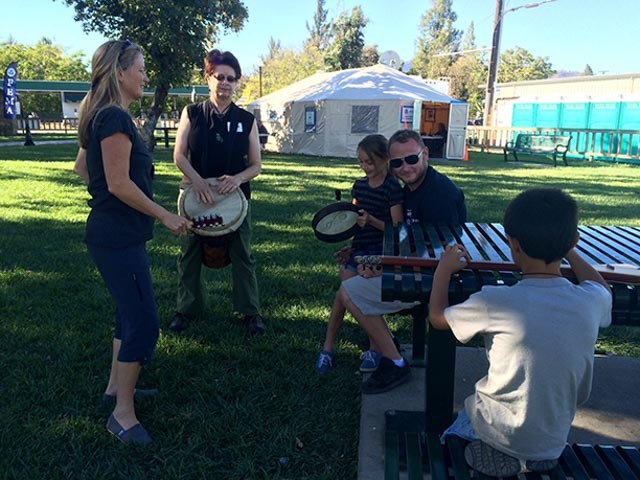 The concert/drum circle brought together more than fifty locals from all walks of life and ages, including one brave Red Cross relief worker from the shelter across the street. You could hear the beautiful music throughout the park where FEMA tents, Red Cross and other agencies set up. We took song requests and got everything from “Amazing Grace” to “Heart of Gold”. “Free Falling” to “Every Little Thing is Gonna be Alright”. With children, we sang “Old McDonald Had a Farm”. Sometimes we just jammed without singing any words. Occasionally, the music was drowned out by ambulance horns and fire truck sirens. More reminders of the noise of tragedy. There is an incredible lineage of song medicine in response to unfathomable challenges. 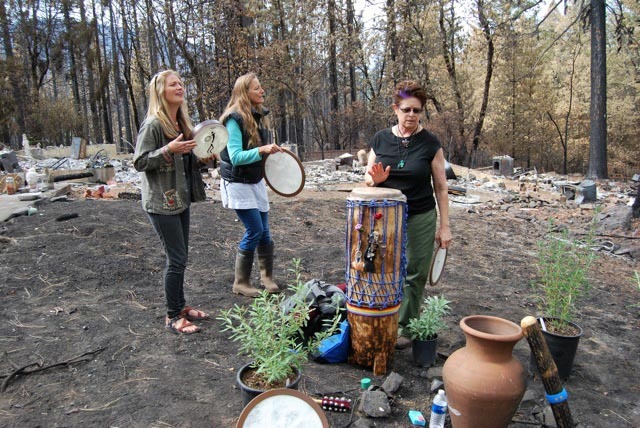 It’s no surprise that while offering music therapy and drumming in the Valley Fire destruction, people requested poignant songs addressing the emotional response to tragedy. At the bench, an elderly couple sat with their clipboards and forms. Their song request was anything by Neal Young. Half way through the song Heart of Gold, the man created original lyrics, “I’ve been to FEMA. I’ve been to Red Cross. Keeps me searching for a home of gold. I’m not getting old.” And then there was laughter and smiles and much needed relief at a situation devoid of levity.